I can’t eat another omelette. 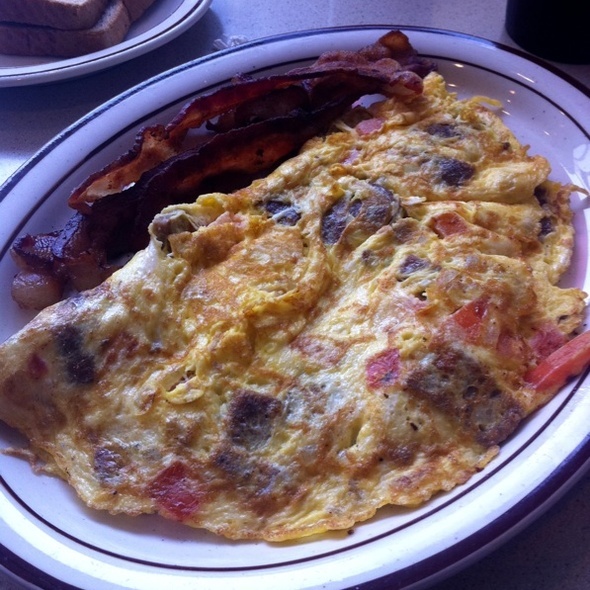 Seriously, my first morning in Michigan I digested a Polish Omelette at Lake Breeze Restaurant in Harrison Township, then yesterday morning I polished off a Gyro Omelette at Leo’s Coney Island off Gratiot–six eggs in two days plus mystery meats, cheese and a scattering of vegetables. Look at it! Amazing in all its egginess, flecked with bits of “stuff;” and yet, not surprisingly, it doesn’t look of this world. 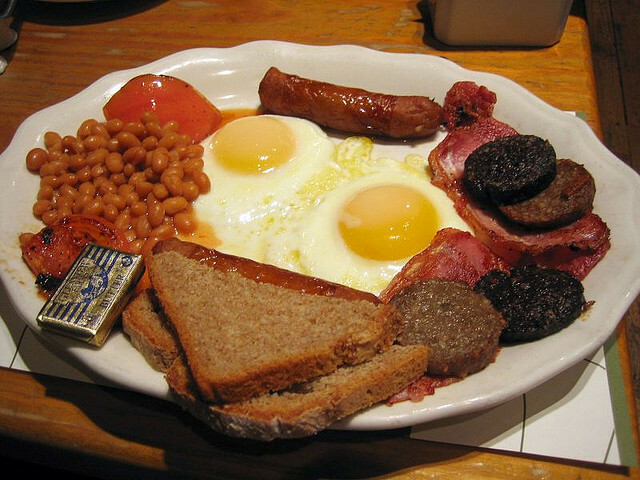 Which reminds me of visiting Ireland for the first time with my son Nick and eating the “Fry” for three mornings in a row–eggs, sausage, irish bacon, tomatoes, fried mushrooms, fried black pudding, baked beans and toast. Apparently this is classic hangover food, but by the end of that third morning we surrendered and admitted our digestive tracts had been conquered. On both sides of the Atlantic, nothing green anywhere. Time to change that, so Nick, his wife and I drive into downtown Detroit for a decidedly wonderful restaurant, first introduced to me by my son-in-law Matthew Wisotsky. On the corner of 14th and W. Lafayette, behind several dark green trees, and beneath a brown horse waits a gourmet slider experience: Green Dot Stables. Surrounded by warehouses, parking lots and one lone bank, this bar shrouded in mythical lore–the original owner maybe owned horse stables, or his son did, maybe once upon a time it was cop hangout–offers a fantastic low-price menu with inventive, outstanding mini-delights along with an excellent beer menu. I start off with a Dark Horse Crooked Tree IPA. Dark House brews out of Marshall, Michigan, and their IPA features a deep orange almost saffron color, a nose with a lot of pine, hops, and citrus and a taste heavy with fruit and a pleasant bitter, tart finish. 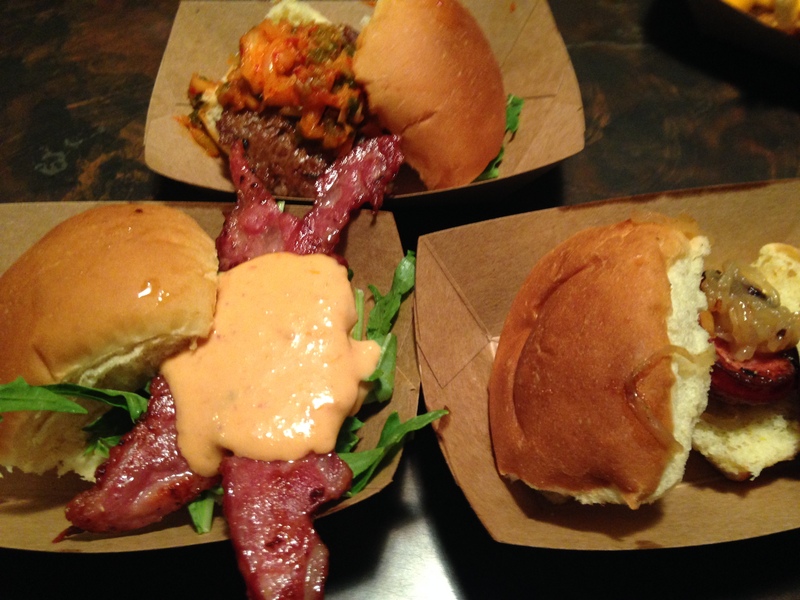 I order a Korean Slider featuring kimchi, peanut butter and a beef patty; a DLT, that’s duck breast, lettuce and a tomato puree; and a Fried Bologna Slider (bologna and grilled onions). At least, that’s how I start. 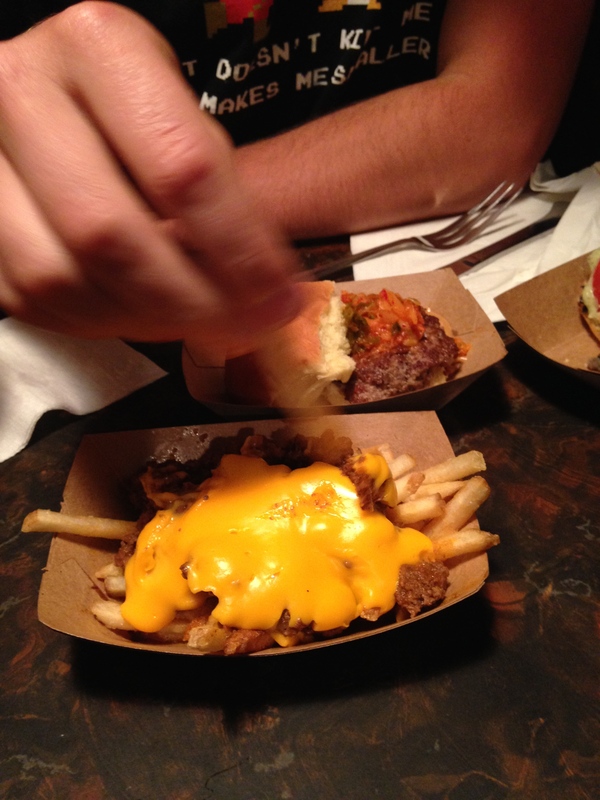 Nick and I also split an order of Venison Chili Cheese Fries. 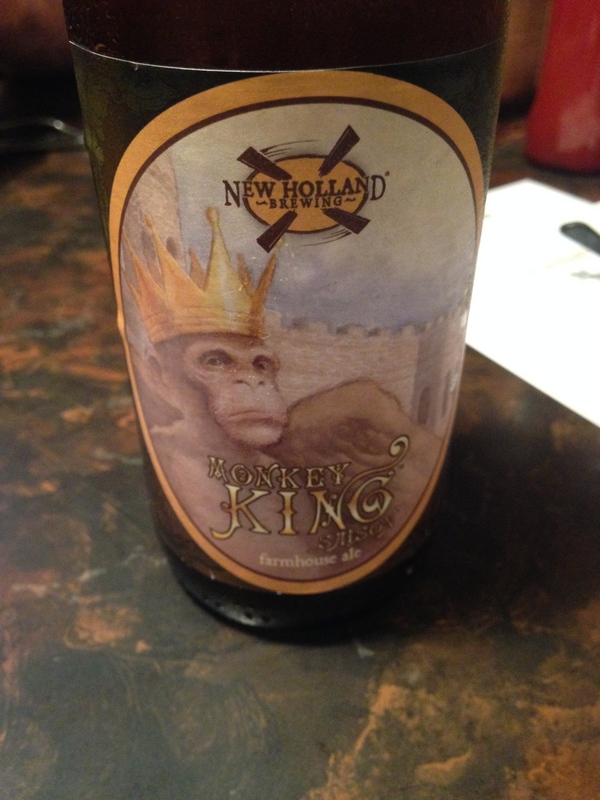 By the time the food arrives, I’ve moved onto a New Holland Monkey King Farmhouse Ale. Oh my, this is good. I love Farmhouse Ales, so when I saw this on the menu I knew what I had to do. Using the colorful language of tasting, this winter brew to be drunk in the summer flaunts it’s golden straw color, tempts with a nose of apples, pears, herbs and wheat, then pays off with a long swirl in the mouth revealing lemon, pepper and clove; the finish retains a smile with tartness and a lingering spicy fruit taste. Yum. As for the sliders? 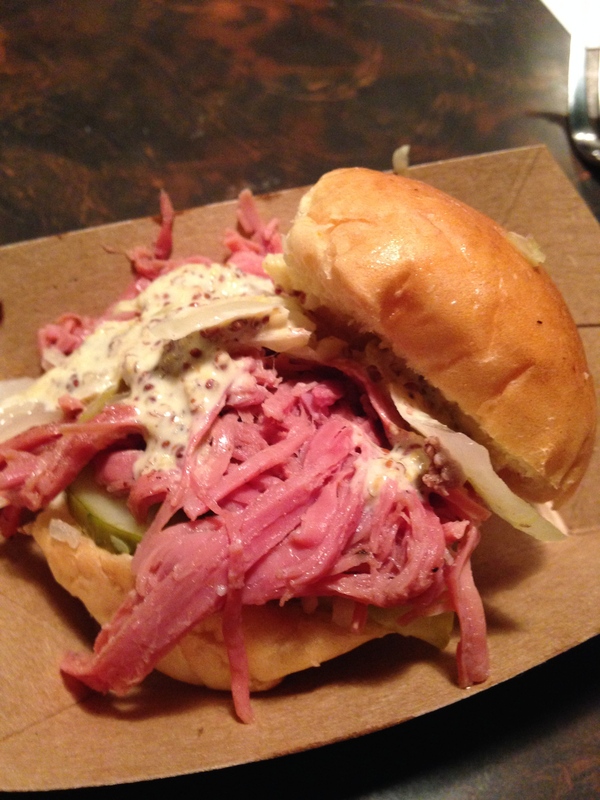 I love the taste of beef, fermented cabbage and peanut butter in a bun–electric! The duck breast doesn’t disappoint, quite succulent, while the fried bologna in its earthy simplicity completes the hat trick. 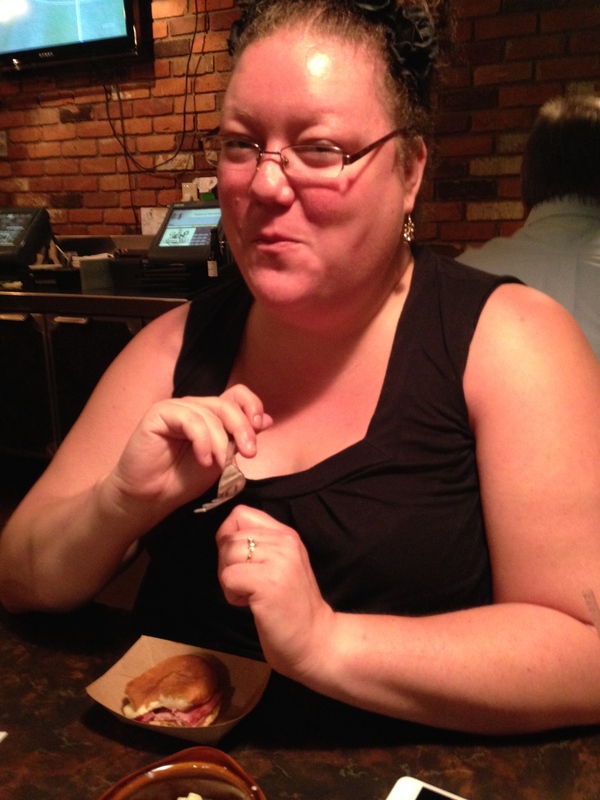 My daughter-in-law Gerrianne smiles with her meal. 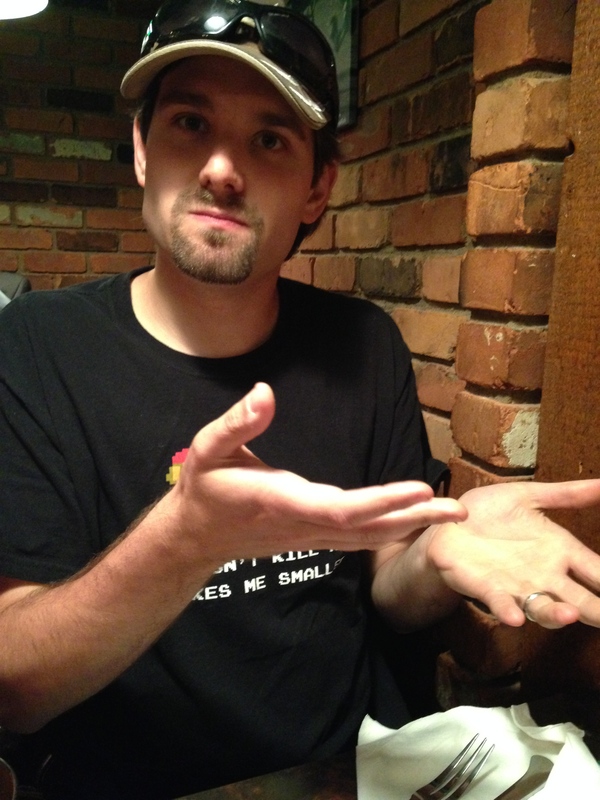 And my son gestures toward something . . .
Oh yes, the Venison Chili Cheese Fries. Excellent. Yet, where is the green? I ordered a fourth slider, corned beef, pickles and mustard aioli. Splendid. 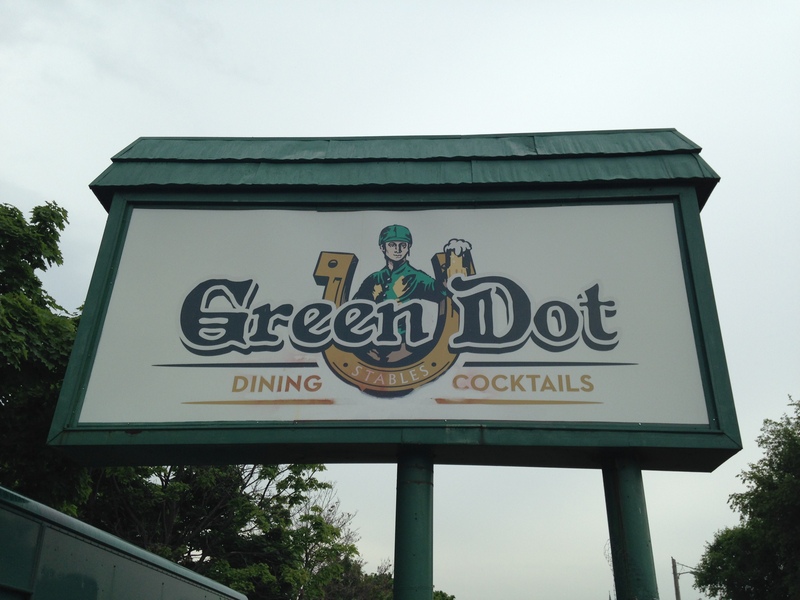 A word about the Green Dot Stable decor. Instead of pictures, let’s use our words. 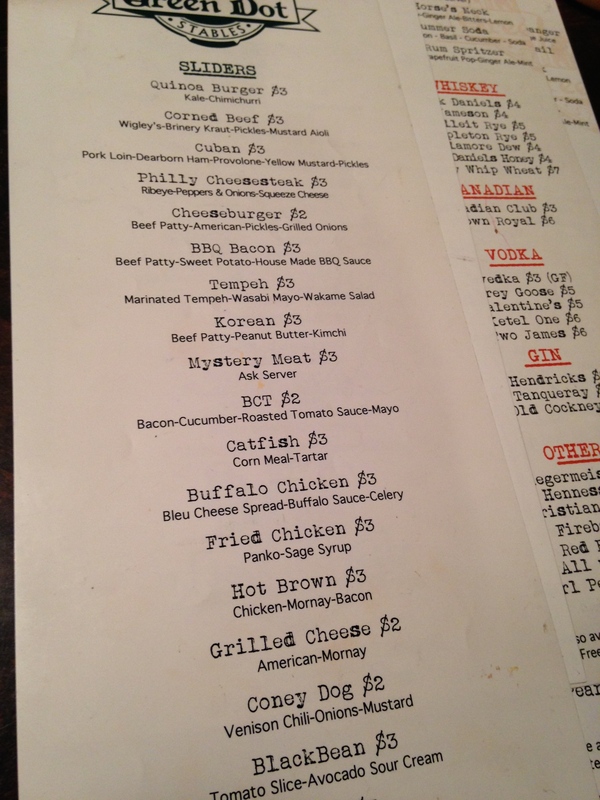 Imagine a seventies sports bar hearkening back to steakhouses of old. Business men in suits, women in floral dresses, children sulking. In the men’s bathroom there’s a portrait of a young man in a white suit with a powder-blue shirt open at the neck. Under him, in between the urinals, waits an ash tray. Classic. A green awning covers the bar featuring real wood, many bottles and a flat-screen TV projecting the orange men of Netherlands running around in their orangeness. Light glows, but darkness clings to all edges. Once upon a time, smoke clouds would have hung heavy and a boxing match would have radiated from the screen. 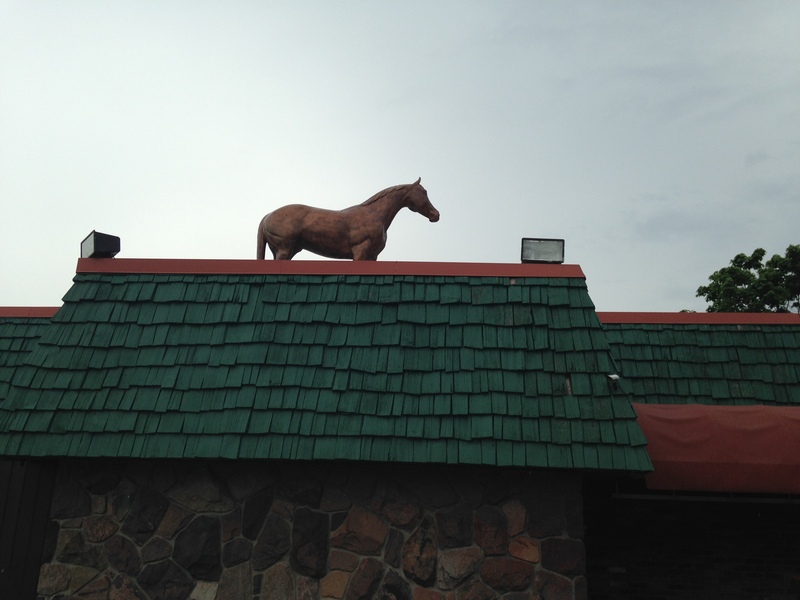 Back to the present, remember Green Dot Stables resides in Detroit, and though you may know this from watching Anthony Bourdain twice visit my fair city (No Reservations and Parts Unknown), there are great eating experiences to have here amidst the ruins. Now we just need a neighborhood to grow up around Green Dot. Time to smile. Time to stop? No. What about the green? 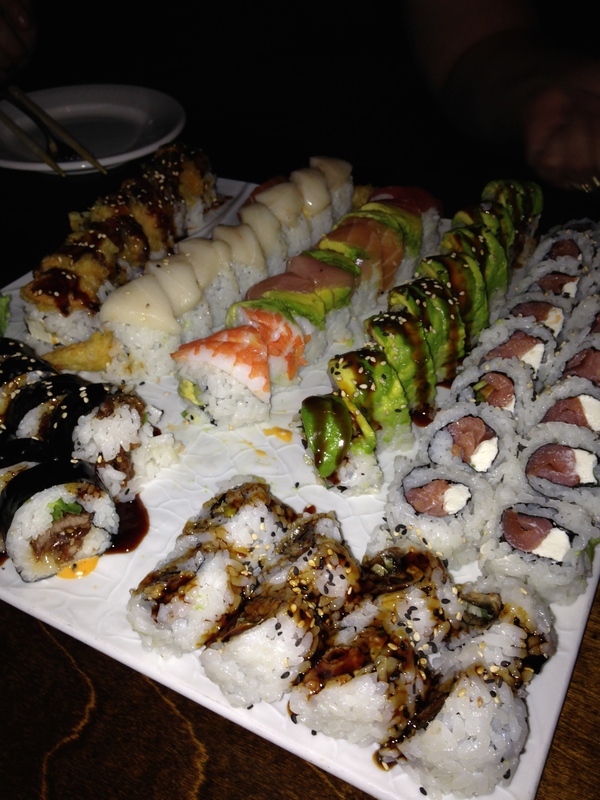 Later that night, we all assemble at Blue Fin Sushi in Grosse Pointe Farms to celebrate Matt and Kelsey’s anniversary. What do we order? Salmon Skin Roll, Philadelphia Roll, Caterpillar, Blue Devil Roll, Mongolian Roll, Rainbow Roll, Miso Soup, Seaweed Salad, Fried Rice. Beverages? Zipang Sparkling Sake, Pacific Rim Rielsing, Hitachino Nest White Ale and a Martini or two. This is not Jiro Dreams of Sushi, and yet this meal fills and suffices. I particularly favor the Salmon Skill Roll and Hitachino Nest White Ale. However, I feel a bit disoriented, bloated, numb, groundless, floating between heaven and hell. What’s happened? I’m with family and we’re laughing, arguing, crying while laughing (we’re very funny people), and overall loving that we’re together. Yet, food prepared by others, served for mass consumption, obscure about where animals and produce have come from, and served by people we have never met before and will never see again, does not really participate in our celebration. I love restaurants, I always have. Chills sneak down my spine while getting ready to go out for a good meal. I even enjoy paying, and considering what the Blue Fin meal cost, it’s a good thing I enjoy using plastic. So what am I getting at? When I’m cooking with family everyone’s participating, the meal becomes part of the family, a direct gift from those in the kitchen to those at the table, and often those are the same people. In the kitchen I know where all the ingredients have come from, this is not about mass consumption, and all become grounded in layers of soil, vegetables, greens, pigs, chickens, fish, dinner table, and the clinking of glasses. With all the cooking our family does, and Matt can offer up a mean grilled chicken, pork ribs, corn and sweet potatoes, I’m not really looking for a grand culinary experience on the fly, but one rooted in my knowing what’s on the plate, how it found its way there, and that every step of the journey I’ve approved the aesthetics and ethics. Maybe that’s a more sustainable picture? Maybe I’m an elite foodie? Have I become conservative in my old age? I say less restaurants, more home-cooked meals, which for me entails a more judicious use of the the planet’s plenty. In The Third Plate, Daniel Barber narrates an outstanding peach at Alice Waters’ Chez Panisse, a peach served as just that and no more, a peach. Masumoto’s peaches were incredibly delicious. But more than that–as if a peach needs to be more than that–they got people to consider good food as inseparable from good farming. You’d think that would be obvious, but chefs often make it difficult to see. When we cook ingredients–whether peaches or foie gras, or most anything–we transform them. Foie gras is seared and paired with mangoes and sherry wine vinegar; peaches are peeled, poached, and perfumed with lemongrass and vinalla. The cooking technique, or the flavor combinations, can be surprising and delicious. (The more aggressive the technique, or the more far-reaching the combination, the more it’s likely to taste merely surprising.) Either way, when it’s in a chef’s hands, all the vectors point back to the chef. Process trumps product. Cooking at home may reveal the source of food and the inner-lives of our family and friends at the same time. That’s a revelation worth having.